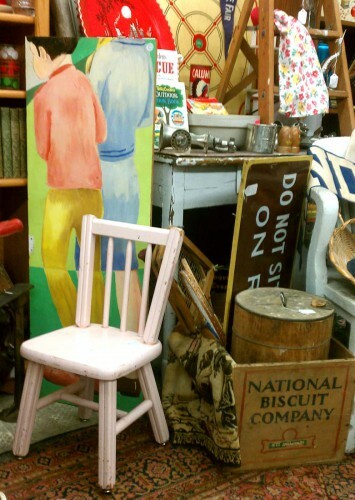 Among the finds, a sweet child’s chair, painted pink. Of course, there was lots of other rusty relics too. We put many of those in our space outside of Exit 55 Antiques, Fergus Falls, MN. (You can see a photo of some of them on our Facebook page here. Don’t forget to “like” us!) While we were there, we also updated our booth space. While out picking, we also found lots of old windows and screens. The screens have inspired a project idea, which, when we have some down time I will share; but it’s certainly not down time now — we have the Elkhorn Antique Flea Market this weekend! We hope to see you in Elkhorn; but if not, you can see what we recently added to our main Etsy shop. 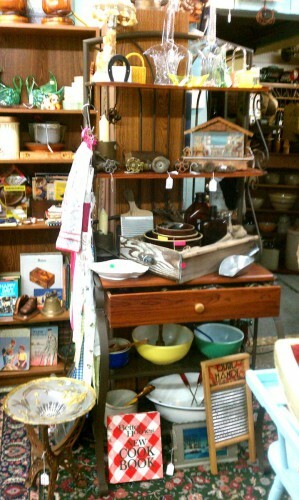 Like the charming yellow vintage Princess sewing basket and the antique cobblers’ shoe or boot last. I am still writing about antique and collectible dolls for the Dolls By Diane newsletter. In January, I wrote a very special piece about boys and dolls which I was graciously allowed to post at my antiques and vintage collectibles site, Inherited Values. I’d love to hear what you think about it. Again, we hope to see you at Elkhorn! One Response to "April Showers Bring Long May Hours For Antique Dealers!"